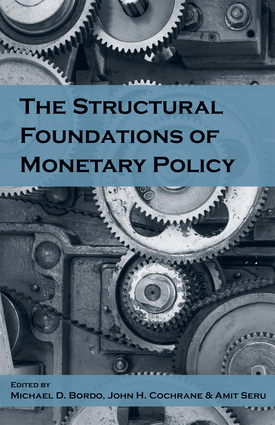 In The Structural Foundations of Monetary Policy, Michael D. Bordo, John H. Cochrane, and Amit Seru bring together discussions and presentations from the Hoover Institution's annual monetary policy conference. The conference participants discuss long-run monetary issues facing the world economy, with an emphasis on deep, unresolved structural questions. They explore vital issues affecting the Federal Reserve, the United States' central bank. They voice concern over the Fed's independence, governance, and ability to withstand future shocks and analyze the effects of its monetary policies and growing balance sheet in the wake of the 2008 financial crisis. The authors ask a range of questions that get to the heart of twenty-first-century monetary policy. What should the role of the Fed be? Which policies and strategies will mitigate the risks of the next crisis and at the same time spur innovation and job creation? How can new technology make the Fed's payment system safer, faster, and more efficient? What does the emergence of crypto-currencies such as Bitcoin mean for competition and stability? How can the Fed defend itself against exploitation and politicization? Finally they propose reforms to ensure that the Fed will remain independent, stable, strong, and resilient in an unpredictable world. Michael D. Bordo is a Board of Governors Professor of Economics and director of the Center for Monetary and Financial History at Rutgers University. He is currently doing research for a Hoover Institution book project titled The Historical Performance of the Federal Reserve: The Importance of Rules. John H. Cochrane is a senior fellow at the Hoover Institution. He is also a research associate of the National Bureau of Economic Research and an adjunct scholar of the Cato Institute. Amit Seru is a senior fellow at the Hoover Institution, a professor of finance at the Stanford Graduate School of Business and the Stanford Institute for Economic Policy Research and a research associate at the National Bureau of Economic Research.